Nothing quilt-related today as I’ve been busy working on the Four Seasons quilt and have no new pictures — yet. But this is the tale of nine ducklings — and it’s a true story! Twelve years ago, a mallard duck nested on the roof garden here and had 7 ducklings. 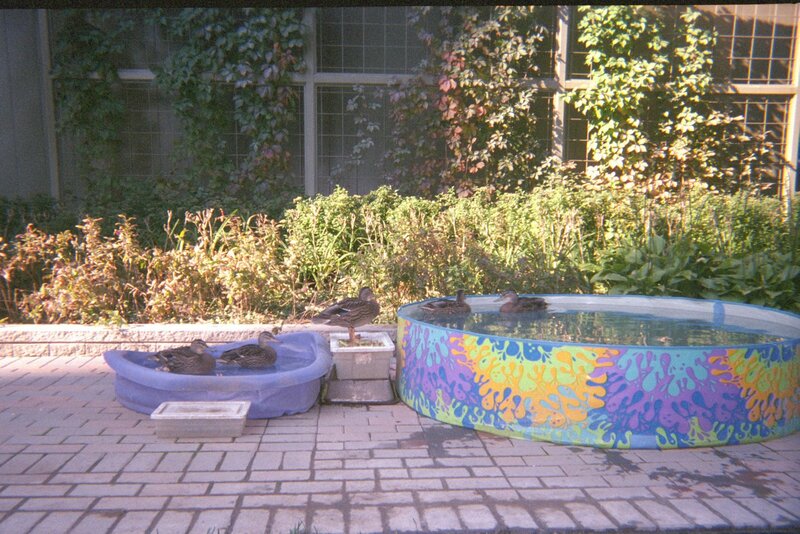 At that time, we had a fountain on the roof garden so the ducklings had a place to swim. Over the next couple of years, some major changes were made and the fountain was unfortunately one of the things that was removed. A theatre complex was built which resulted in a second-level roof garden on to which no one could go. It was planted with all sorts of ornamental grasses and bushes which made it very attractive to look at and clearly became very attractive to a mallard, even though there was no water in sight. About halfway down between the two roof garden levels, there was a small ledge. A year or two after the renovations were complete, so about 8 years ago, a mallard duck again made her nest on the upper roof garden. That year she had 9 ducklings. Our apartment faces out on to the roof garden. One afternoon in late June we heard an incredible amount of quacking. “Quacking? ?” we wondered. Sure enough — there was the mother duck on the little ledge with her 9 ducklings. How she had got the ducklings there no one knows (or really wants to think about!) but there they all were. 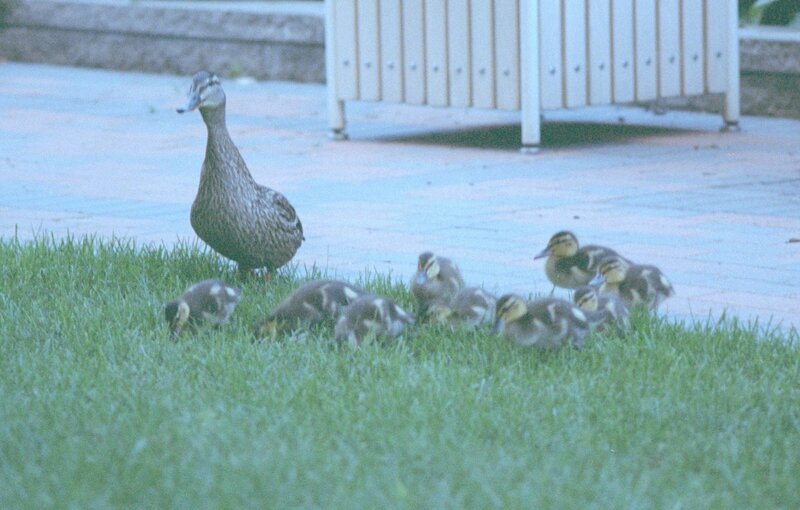 We got building maintenance and security personnel to assist in getting the ducklings down on to the main roof garden. 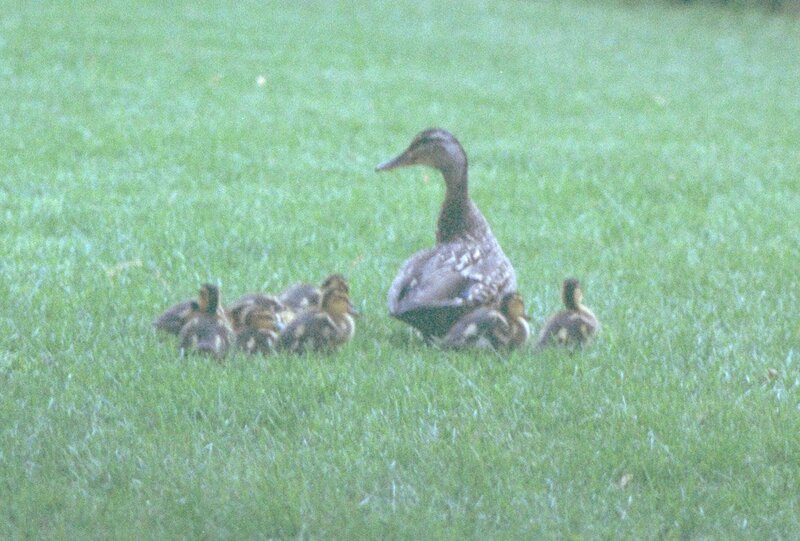 Mama Duck wasn’t thrilled with these people handling her babies, but once they were all down on the grass, she was fine. Over the first few days we all watched as the duck and her ducklings investigated their territory. We made calls and found a place about 90 minutes north of here that carried duckling food so off we went to get bags of that. We contacted a vet at a duck farm north of here who gave us advice about feeding and when and how to start tapering off the feeding. The amount of help we got from people like that vet was wonderful. It quickly became apparent that they had to have a water source. 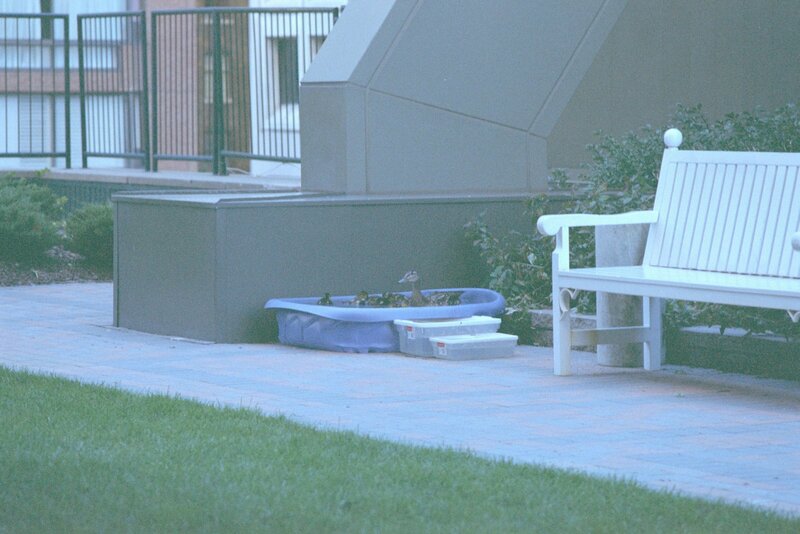 When the ducklings were still tiny, we had this wading pool out for them. The little white boxes are just plastic storage boxes that we made steps out of so they could get in and out of the wading pool relatively easily. They grew very very quickly and we soon had to get a much larger pool for them. We drained and re-filled that thing every day for about 2 months. They still liked to play around in the little wading pool, so it was left out as well. We watched as they started testing their wings — and sometimes were holding our breath! We watched as the mother duck would fly off for an hour or two some mornings and then come swooping back to make sure her ducklings were okay. Shortly before Labour Day weekend the ducks started to leave. Late at night we would hear a few very loud quacks and the next morning there would be one less duck still here. It seemed like I was doing a head count almost every morning. The last duckling to leave appeared to have some difficulty so the Humane Society was called — they came, took the duckling to be checked out and then called us saying it was fine and we were lucky enough to be given the opportunity to take it down to Lake Ontario and release it. This is a huge building, with an enormous amount of people in it who have access to the roof garden, but that summer was almost magical in that people who did go out on to the roof garden were very careful not to startle or try to get too close to the ducks. When I look back on that summer, I am absolutely thrilled we had that experience. How many people who live in the middle of the concrete jungle of the downtown area of a major metropolitan area get the opportunity to watch ducklings grow up and learn to fly? We were very very lucky, I think. Thanks for that, it renews our sense of faith in people. A delightful little tale. Oh what a totally happy, neat, lovely post. Undeniably the best share of the day! There is something about babies, whether they are winged or human that softens our heart! Thanks for sharing such a wonderful story. Awww…what a great story! And the pictures are just precious. Thanks for sharing. I’m so glad this story has a happy ending! Thank you for sharing it with all of us. you were indeed very lucky to experience that. I was raised on a farm and took it for granted that everyone had animals and birds around them. Then I grew up and learned that like you say, in a concrete jungle many people never see anything like this. Thanks for sharing all of the pictures and the story. I love this story — thank you for sharing it. I loved this story! As a farmer, it’s neat to hear how much city people get such a kick out of livestock as well as wild things. Not that we farmers don’t… we do! It’s just part of our normal day. Thanks for sharing! This was such a treat! What an amazing experience! And what a neat sense of community it bred! What a wonderful story Cathi!! What an amazingly cute story! You have quite the cooperative set of neighbours there..all pitching in and helping…lovely to hear. Such a wonderful story, Cathi. And how lucky you are for living such an experience. Thank you for sharing.